Today is SUDEP Awareness Day. SUDEP is Sudden Unexplained Death in Epilepsy, and 1 in 1000 people with epilepsy will die from this. People who have uncontrolled seizures, who experience a lot of seizures, or who have tonic clonic seizures are believed to be at higher risk (1 in 130). There is no way of predicting when SUDEP will happen, it just does. The cause is unknown, but it's believed to be in part with how seizures affect your breathing or heartbeat. I hadn't heard of this as a condition in its own right - thank you for raising awareness. The more it's talked about the more chance there is of some serious research. Can you find out if there is any research going on and perhaps volunteer for a drugs trial? I'm going to be taken onto an asthma one. The benefit (apart from perhaps being given a drug that will help) is that you're usually seen by top people in the field. Might be worth exploring. SUOEP needs to be wider known; have they a publicity campaign? I know about the problem, as I have a nephew with horrible seizures that can't be controlled and live in fear that this will happen with him. I hope more people become aware of the problem. There are over 40 different types of seizures; I have ones where I'm aware but can't move, ones where I lose consciousness but appear awake, and walk/fiddle, and ones where I lose consciousness and fall to the ground. To show how epilepsy affects me, this is an app I started using on the 13th October 2017 to record my seizures (this was after the A&E trip where I had over 60 in one day). Since mid October I've had over 150 seizures. Seizures aren't just 'have a seizure then get up and go'; you're affected before and after every seizure, and can sustain injuries during too. After a cluster of seizures I'm usually out of it (talking nonsense, confused, wandering, lost etc) for over an hour, and I can have several clusters a day. My memory is hugely affected and nowhere near as good as it used to be, I forgot my parent's phone number, a number I've had memorised for 15yrs!! You live in fear of where the next seizure will strike and if you'll get hurt, you can't go anywhere on your own, and if Lyle has to leave me we're both scared. I can only rarely have days out with him, even just nipping to town for a few hours, and after days out the next day has to be a 'rest day' due to increased seizures...epilepsy is much much more than 'just seizures', and there are puerile out there who have it much much worse than me. There needs to be more education about epilepsy as members of the public and even medical staff are so uneducated. Good grief, Red; you do so well to cope with all this. I do hope they are able to help you in some way. Got some sort-of-really-good-news from our complaint about the NHS today! I think I posted about when I ended up in A&E and the Dr's blamed my "seizures" (air quotes on their part!) on my mental health, and told my mum that no staff witnessed any of these "episodes" whilst I was there? OK, Dally it is then.. I hope this means that they are really going to do something to help you. Good news - you're on your way now! Do you keep a full diary at all? Can you identify the triggers? Take it with you when you (eventually) get seen. Is the hospital doing a direct referral to neurology or are they expecting the GP to psychically know without anything from them?! Something else you'll probably have to chase up. You do cope really well with life in general and I am in constant admiration of that. One other question-why Dallas? Just like it or is there some meaning? Thank you Lynn & CC! Yeah, we've identified over ten definite seizure triggers and I have 5 A4 pages covered in notes about how I feel before, during, after, triggers, things that helped, things we've tried etc...all to show some poor Dr hehe. I dunno about the referral, they made it sound like they'd contacted my GP electronically, but it's not like we'd have any way of knowing. I'm in the process of trying to switch to a new GP surgery (out of area application), so I have fingers crossed they'll accept me & I'll get a helpful, compassionate new doctor! Well to us ladies of a Certain Age, it instantly conjures up big hair and shoulder pads...but your generation weren't afflicted with the telly series!! I like Dally, it suits you. I should have changed mine when I got the chance...perhaps when we get to 18 we should all be given the chance to change our names! Yes I like it too, but then I loved the name Scarlet as well! I saw a film last night called Jupiter Ascending (awful film, left it on for background noise only!) Jupiter was the name of the main female character and I thought that was a great name. People are far more creative now - still like the traditional names, especially for boys. Easier for a girl to carry off an unusual name I think! I changed my name - I was named after an aunt with a very old fashioned name which was awful. My kids only found out a couple of years ago and none of my friends know my birth name! Can we still call you Red on here?! What was it, Kate? Evadne? Ethel? Euphemia? Go on, spill! Nope, I'll share most things, but not this!! Euphemia is great though-lets start a campaign to bring it back! Hi everyone. Think of you lots, even though I rarely show up here. Congrats on the new name, Dallas-Red. As a result we have a phone appt with my dreadful GP this evening. Lyle's taken the form in as evidence that says A&E sent her a request electronically, AND a third consent form from me!! Both will be on the system for this evening though which should help. Good luck, Red, I hope they can help you. I hate all this computerisation; it leads to all sorts of excuses, it seems to me. You should contact the practice manager and ask her why the letter wasn't actioned. If the hospital believe it was sent electronically and they maintain it wasn't received there is a serious risk element that needs to be investigated. I hope they are going to get their act together soon, Red. This is getting ridiculous waiting all this time to even get an appointment, let alone for them to actually do something to help you. Thank you Lynn, and guess what? I HAVE AN APPT!!!! Hahaha I can't believe it!! It's early next month, that call from my GP really worked huh! "Does anybody have any advice for phoning the hospital to ask if they can provide a room with dimmer lighting for me...? If I have to sit in a room with fluorescent lighting I'll end up having back to back seizures, and be unable to talk, think, feel sick, confused etc...any advice appreciated!" Surely the person you are going to see will be well aware of the condition and its various triggers? Just write to or call the secretary and ask the question. Kate is the one to ask really. Good luck, cherub. God, poor you. Stupid question, I suppose sunglasses don't help? Or glasses with different colour lenses like the ones that some dyslexics wear? They've really helped though. With natural outdoor lighting and dimmer lighting settings they reduce my seizures by about 30% of what they would be. Even though I think they do help a little in bright (eg fluorescent lighting, banks, supermarkets etc) places, it's just too much for them and I still end up destroyed haha! To make it even worse the nurse we spoke to said we could have been referred for an appt at the hospital 10 minutes away rather than 70+ minutes, but that if we switch now it'll push our appt back so we can't........like, just why? ...and why did she tell you, because that's bloody frustrating. How about - and this is weird - holding Lyle's arm everywhere and keeping your eyes closed behind your glasses? Then as soon as you're with the doc/nurse, open your eyes and let them see what it does to you. You are correct Red, hospitals have to cater for the majority and it's very difficult to manage such a large facility for a small minority. However, it is ridiculous that they can't find a room where you can sit in darkness (the problem with that is you'd probably be forgotten)! What you need is an 'ambassador'. Try contacting the PALs team, or (and this is random!) do they have a chaplain that might be more sympathetic. Speak to the consultant's secretary - they must be aware of these difficulties. The complaint department - make it clear you don't want to complain, you just need some help. You just need to find a sympathetic person who will try so ring round and keep asking - I'm a sucker for a "I really don't know what to do I need some help" calls. Sadly it seems I'm a minority. As soon as you get in to see the doctor ask to turn the lights off - when Danny had meningitis, after 4hrs in a windowless room and rolling in agony it was the first thing the consultant did. They usually do understand! Everyone is entitled to patient choice. The GP should have offered you options, but TBH if it's a choice between 4 weeks and 70min journey, or 13 weeks and 10 min journey which would you choose? The reality is that hospitals have different waiting times and capacity, and the NHS don't have enough money to make it equal everywhere. Nursing staff don't understand how primary care and referrals work, so she should've either kept quiet or got her facts straight. I suspect her intention was to push a 'challenging' patient elsewhere so that she doesn't have to sort things out. Solved it; get an appointment at Kate's hospital and give her an 'I really don't know what to do I need some help' call! But those were brilliant ideas, Kate, I hope Red can use them. I was trying to explain to my mum why I was so terrified of the appt, but it's just hard unless you've lived through lights triggering back-to-back seizures and how crippling it is. Everyone keeps saying "well you just have to keep telling yourself to get through the bad so things can get better" and it's like you have no idea how awful and scary it is though, and I really don't want to end up in status again My parents spoke with each other though and are gonna come drive me to the appt which is a huge relief; I don't have to worry about puking or acting bizarre on the train anymore. Kate thank you so much for the advice. I wrote out an email to PALS but then just...thought eff it. I'd probably wind up with the person who (badly) handled the last complaint and nothing would get done anyway...I have welders goggles that are even darker than polarised ski goggles, and we gave them a test run at the supermarket yesterday, my first time going in weeks. I went and did a small weekly shop and had no seizures, which for me is HUGE! I haven't been out like that in a few weeks because my seizures are so bad. I'm hoping they might make a difference at the hospital visit. I'd they don't help enough ill just sit under a coat or blindfold I guess. It's very hard for anyone else who hasn't been there to understand what a personal hell illness can be. You can't explain it. I liken it to sympathising with people who had bad backs. Then I trapped a nerve in my spine - my God, you wouldn't BELIEVE how sympathetic I am now to anyone with a bad back! As long as you realise they're trying to help and they're on your side, then that's all you can ask. And pray God they'll never really know what it's like. Be kind to yourself, chicken. Hmm, patient choice trumps everything. You can literally be referred to any hospital as long as they offer the service you need, however many GPs think they know best, or have experience of one hospital being better than another, or their mate works there and they want to keep their service running by utilising it, or they just can't be bothered to give you a choice. If you wanted to you could be referred to Cornwall, though it wouldn't be very practical! I had my appt with the neurologist, it was good, although nothing happened then and there. Loads of information given to her, and the neurologist actually thanked me for my copious notes (they actually had a contents page ), she took photos of several pages so she could digest the info. She grilled Lyle about symptoms during and watched one of the many videos we had ready. Overall she was just really sympathetic, asking when I ever had time feeling 'normal'. She said next step is to work out what's causing the seizures, epilepsy, tumour, non-epileptic seizures etc. That means an MRI and EEG, but neither of those can rule out a diagnosis of epilepsy, so if they come back clear I'll be put on anti epileptic medication and if that helps diagnosed then. That all sounds much more hopeful for you...now you can relax a bit and have a peaceful Christmas with Lyle and the menagerie! How many beasties have you got now - I've lost track? That all sounds quite positive - she's taken you seriously, put in place tests to carry out, and a plan. As an aside, we had a cat at rehoming that was having a similar sort of thing - she would space out and drool, and then sleep for a long time afterwards. The vet did loads of tests but couldn't diagnose and said she considered him to be pre-epileptic. Said he may never develop it and may grow out of it. Unfortunately a few days before he was due to leave he had his first atypical fit. However, he is now on medication and is doing fine! The NHS is a huge, ancient, outdated behemoth that moves at the speed of a tanker when it comes to changing anything. I think getting them to change terminology takes years and is usually facilitated by support organisations. Locally hospitals should have patient reference groups (or something similar) but I suspect you are talking about something national. I would suggest contacting a big charity or support group and ask them what they're doing to influence the NHS. Write to them all and copy to Simon Stevens, Head of the NHS. You need to remember that the NHS is made up of human beings and some can change their ways a lot quicker than others. Even if the NHS issue a dictate it will still take a significant amount of time to be implemented (and is often outdated as soon as it's issued!) so you have to be patient and persistent to effect a change. Good luck! Posted By: chief chicken That all sounds much more hopeful for you...now you can relax a bit and have a peaceful Christmas with Lyle and the menagerie! How many beasties have you got now - I've lost track? Far, far too many CC It ended up being a really horrid Christmas unfortunately, as a few days before one of our pups very suddenly had to be PTS...it was absolutely awful and it's taken me a long time to get over it. I was in a huge slump. But I'm finally, kinda, moving on and doing a bit better. Sorry Kate I forgot I'd asked that question!! Damn the NHS The thing I was referring to this time was a form with a really sexist/derogatory term on it. I got the same form from a different hospital and the wording on that one was much better, so I wonder if I could direct messages to that one particular hospital...blah, I've had an aura and am struggling to make sense aagh. I'll be back once I've gott the seizure out the away. Posted By: Kateb That all sounds quite positive - she's taken you seriously, put in place tests to carry out, and a plan. As an aside, we had a cat at rehoming that was having a similar sort of thing - she would space out and drool, and then sleep for a long time afterwards. The vet did loads of tests but couldn't diagnose and said she considered him to be pre-epileptic. Said he may never develop it and may grow out of it. Unfortunately a few days before he was due to leave he had his first atypical fit. However, he is now on medication and is doing fine! Kate, dogs can have different types of epileptic seizures just as humans can, so I bet cats can too. The cat was most likely having partial or absence seizures, and they developed into tonic clonic. The same thing often happens in humans if other ty[es of seizures aren't discovered or treated soon enougj. 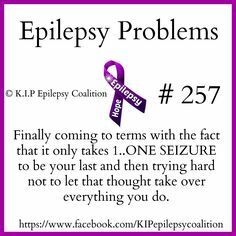 Simple partial seizures for example don't show up on EEG tests, and absemce seozires don't have a postictal phase and don't last lonmg, so can be easy to miss. Um, so I thought I'd do an update on seizure stuff. I had delayed my MRI, which was supposed to be the 20th, because they'd sent me to the hospital 90+ minutes away, so I asked to delay and get all future appts referred to the hospital 15 minutes away. Yesterday I got my MRI appt through and it's this Friday, aaaagh!!! Lyle phyoned the hospital (sorry, ignore my typios my head's a mess after the seizure and I can't be bothered fixing them ) today to ask a few questions. A few about lighting (can lights be turned off or dimmed) and one on what happens if I have a seizaure in the MRI machine. Well...the nurse said if I have a seizure the MRI image will be ruined and will be for nothing!!! Lyle explained that I have a lot of seizures daily, and that with travel and the lights triggering me, I'll almost definitely have at least one seizure during the 20-45 minutes of the MRI. The problem is during seizures I often move my hands and fiddle, and before/after I'm very twitchy and can't control it...so that would ruin the MRI. Basicallty it's gonna be a nightmare I'm bloody glad we phoned up to ask the questions and mention it to them tjhough, as otherwise they wouldn't have had a clue and we wouldn't have known how damaging to the image even the slightest movement would have been!! So. That's this Friday. I don't have an appt through for my EEG yet, but once they're both done, regardless of if both show nothing, I see a neurologist again and get put on meds. Ideally the MRI will show nothing (that's the one I'm most scared about), and the EEG will show weird brain waves that indicate a seizure, so I can be diagnosed...but we'll see. I'm so sorry about your dog Red, which one was it? Yes, if you think the wording could be improved write to the chief exec, copy to complaints/PALS/the dept that the form refers to. Tell them you're offended - a threat that could result in someone kicking up an equality problem is extremely effective!!! Can you be sedated for the MRI? I didn't think it could be paused but I don't know-they're always perfecting things so maybe it can now. Well done on being proactive and I hope the experience isn't too traumatic for you and brings about some relief from your fits. You're right about the cat. As far as I know she's doing really well and doesn't fit much. It's probably because she's settled now, going to a new home can be very stressful and that in itself will cause them.